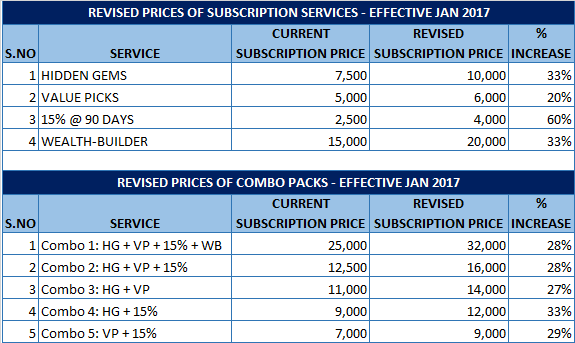 As you know, prices of our annual subscription services will increase by end of the day today, 31st Jan'17. We are thankful to our readers for giving overwhelming response by joining our services at best discounted prices before price rise. Increase in prices of our subscription services will get implemented by end of the day today, if you are still thinking to join, Act Now! Once we implement revised price structure on our website today, you will not be able to subscribe at old price. The increase in subscription prices of our services is decided after evaluating important business aspects and value addition to our existing services during this year. Moreover, there was no revision in our subscription prices since 2012, we offered our services at similar prices during last 4 years. This is the last opportunity to subscribe to our services at best discounted prices, we would not be able to offer subscription at current prices by end of 31st Jan 2017. Below are the details of our annual subscription charges currently which will increase by end of the day today. Click on SUBSCRIBE! link to subscribe to our services online using debit / credit card or net banking facility. We are glad to inform you that you can subscribe to our services at current prices before the subscription prices increase. This is the last opportunity to subscribe to our services at old subscription prices as you would not be able to avail these discounted prices after revision of our subscription prices by end of this month. 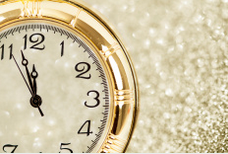 Our existing members can also extend their subscription by 12 months. Being an existing member, if your subscription expires in any month of 2017, it will get extended by 12 months and will remain active till respective month of 2018. During past 6 years, we launched suitable services to help Investors to create wealth by investing in Indian stock market. Its appreciation and support of our readers that one of our most admired service - Hidden Gems ranks on top not only in performance but also on Google search engine. Try it out yourself by searching "Multibagger Small Caps" or "Hidden Gems Stocks" on Google, you will find our website www.saralgyan.in featuring on top in search results. Its your appreciation and word of mouth publicity which make our website featuring on 1st position in Google. Its our mission to ensure that you reap the best returns on your investment, our objective is not only to grow your investments at a healthy rate but also to protect your capital during market downturns. We also take this as an opportunity to share the returns on investment given by one of our most admired service Hidden Gems during last 6 years. Hidden Gems (Unexplored Multibagger Small Cap Stocks) continue to shine giving as on date average returns of whopping 281% to our Hidden Gems subscribers compared to 52% returns of small cap index during last 6 years. Hurry! Its the last opportunity to subscribe before the price rise... annual subscription charges of our services will increase by end of the day today.